Setting up your Public Online Booking Calendar only takes a few minutes. Login to Fons and navigate to the "Account" tab then "Public Booking"
*Note if you setup and enabled your public calendar and you get an error, "the page cannot be displayed", navigate to the staff feature tab and make sure at least one staff member has a provider role. How To Instructions. 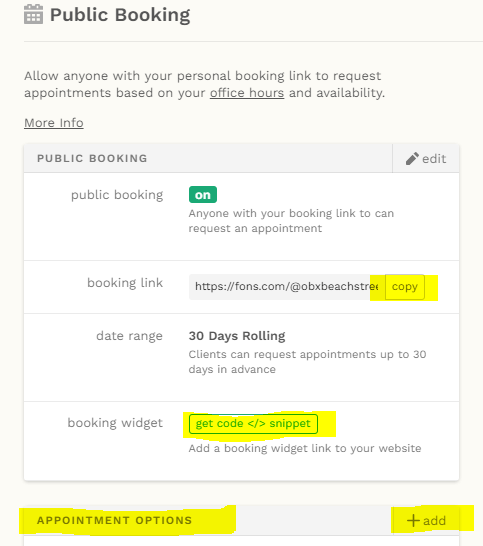 Share: Share your Fons booking link via email, text, or embed it on your website. Copy the booking link and send it any form of transportation! Clients without a Fons account pick a time and appointment type. Then the request is added to your calendar for you to confirm. Clients with a Fons account only have to pick a time. The rate and duration is predetermined based on their client profile, just like through the normal Fons app.